Jump on and get ready to play the 90's hit classic re-release Extreme-G 2 on Steam! 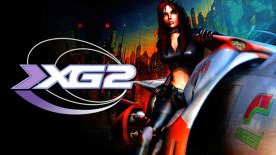 Extreme-G was the slickest, quickest, most breathtaking racer ever. Take control of the evolution bikes in XG2 with sharper handling, quicker acceleration, new top speeds, and tracks that will leave you gasping in the second of four titles in the franchise. Play this classic title repackaged for Steam today! Unique Environments: Race through extreme cityscapes, bubbling marshes, underwater caverns and more. Greater Variety of Weapons: Including the Rear Firing Rocket, Magnetic Mine, and much more! Choose from 10 Futuristic Bikes with improved control, more realistic bike handling and ride characteristics. All New Characters: Meet the men and women inside the machines! 3 Top Secret Bikes and Characters! Enhanced Tracks: Wider, longer, faster than the original! Sonic Boom: Break the sound barrier! Picture in Picture: For rear view and missile cameras. Ghost Racer: Race against your previous best time. Data can be saved.